Clicking on the Show unapproved events will display any submitted events that have not been approved. They will be highlighted in yellow. The above event is a non branch event. The following event is a branch event. The Approve?, Remove?, And Return? Links are for the Calendar Manager. The Approve? link sets the approved flag and makes the event visible to the public. The Remove? link will delete the eevent from the calendar. The Return? link will allow the Calendar Manager to send an email back to the submitter for correction. This email will have a link that will allow the submitter to edit the event. The Edit Event and Copy Event links for a non branch event will bring up the same form as the Submit Non Branch Event link which is discussed at the Branch Calendar? entry. The Edit Event and Copy Event links for a Branch Event as well as the Make Branch Event link for a non Branch event and the Add Branch Event links will bring up the Edit Event form as below. A note on Copy Event, clicking this link will create a copy of the event and then bring up the appropriate edit form. This was created for branch members who wish to repetitively enter similar events (such as Monthly Parties). 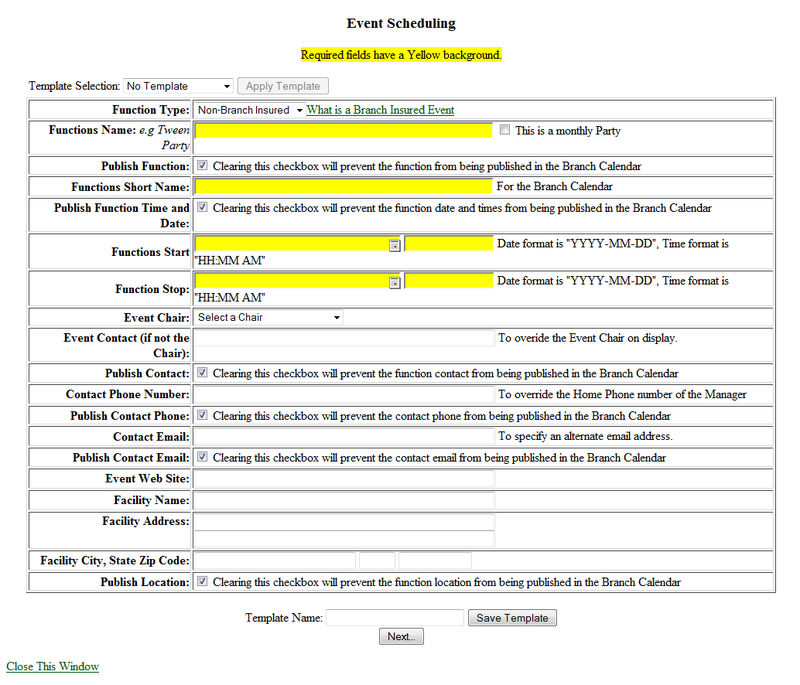 Event Templates were also developed for this purpose but is more universally useful. The Copy Event link can only be used if the source event is visible and the calendar hides events that have passed. This form is similar in function to the Non Branch Event edit form but has additional information required by the Insurance Policy. After filling in the required information and optional information as appropriate, click the Next… button. 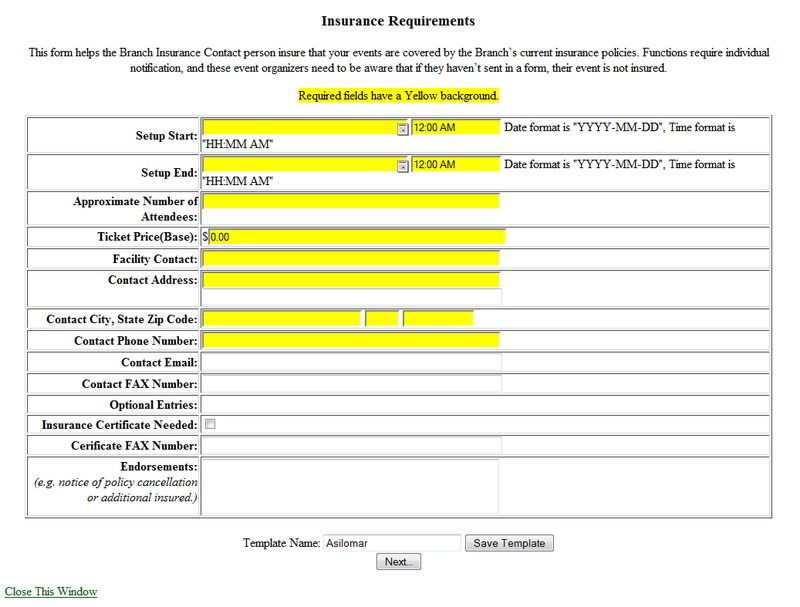 If the event is a Branch Event (requiring an Insurance Certificate), the following form will display. Clicking the Next... button will bring up the following form. 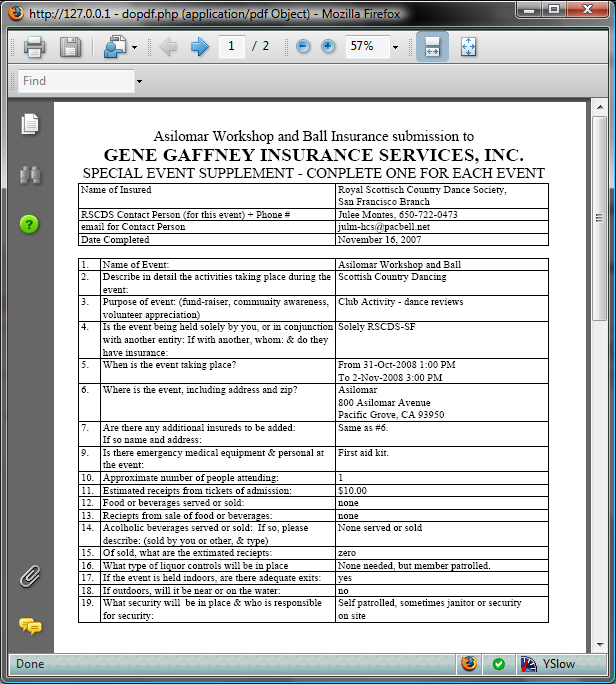 The Open Insurance Form on the Event Display will open the completed Insurance Form.